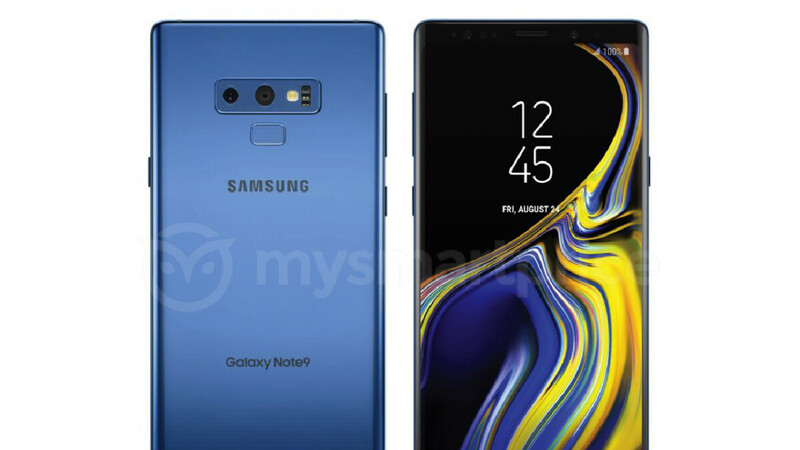 Samsung’s Galaxy Note 9 is currently set to be announced in just over two weeks and, so far, numerous leaks revealing both live images and press renders of the device have appeared. In fact, most recently, the Lilac Purple variant of the smartphone showed up online. But today, yet another press render of the device in Deep Sea Blue has appeared, coinciding with the image previously posted by Evan Blass. Confirming what is already known, the image in question shows off a design that is pretty similar to that of last year’s Galaxy Note 8. This means that a tall Infinity Display will once again dominate the front panel, although Samsung has made an effort to reduce the bottom bezel ever so slightly. Moreover, despite the horizontal camera setup making a return on the rear, Samsung has modified the placement of the fingerprint scanner. Also, significant improvements to the S Pen have been made, with the stylus now supporting Bluetooth. This means users will be able to control music, remotely unlock the Galaxy Note 9, and also utilize the accessory as an external shutter button. As an added note – no pun intended – depending on the color variant of the Galaxy Note 9 chosen, some S Pens will be shipped in contrasting colors. For example, the Deep Sea Blue variant seen in the image above looks set to include a gold-colored S Pen. In regards to the actual specifications of Samsung’s next flagship, a pair of 12-megapixel sensors are expected to be present on the back of the device – a telephoto lens is among the two – while the front will be adorned by an 8-megapixel camera. Additionally, on the processor side of things, the Galaxy Note 9 will match the setup seen on the Galaxy S9 series. This means the US will receive a Snapdragon 845-powered variant, while international markets will receive the Exynos 9810 processor, although 6GB of RAM should be present in either case. Users should also be able to choose between 64GB, 128GB, or 256GB of internal storage which will be further expandable via microSD. Lastly, rounding out the package will be Android 8.1 Oreo straight out of the box and a large 4,000mAh battery. For those interested in Samsung’s next flagship, an announcement is currently set to take place on August 9 alongside the Galaxy Watch. Shortly after this, pre-orders are expected to commence on August 14, while shipments are slated to begin on August 24. End of the Note Line, as we've known it? Again with the childish banter... If you actually paid attention to the site, one article entails that Samsung is considering combining both the S line and the Note line since the introduction of another flagship, the Galaxy X, would not be cost effective. piyath cant afford a Note or S, so he is jealous. am i the only person who loves this design? yes you are the only person in the whole planet. be proud of it. ill give you a nice gold star TM badge you can wear proudly in the streets of brooklyn and let everyone know how you jump out in the crowd. my little brave hero. Nice, and the wallpaper makes it pop more. It will have a cooling system and a FULL version of Fortnite. With the supposedly larger battery (how did they fit that in?) I haven't seen any reference as to the Note9's thickness. Me, I wouldn't mind a chunkier Note as they could have fitted a 5000 mAh power source in there with another 1mm of thickness added. Go bigger and bolder or go homer. SMH. 5000 mAh battery? Who else is doing that? I agree. I bought the Black Note 8 for that exact reason. I will more than likely buy the blue this time. Hoping they bring that blue to Canada otherwise black for me. Would have been nice if they used the S9 blue. Personally, I thought they finally found the "sweet spot" with that hue. The Deep Sea Blue is kind of gaudy imo. Well done Samsung for not going with Notch trend. I really like the new battery size, but Samsung is just too late with this. Hopefully this big battery trend will carry on to their new S10 line, the current battery sizes are pathetic. now what? color gimmick? or just marketing bait? still looks like coral blue on S9's,..deep sea blue? come on sammy..
Not impressed... Burgundy Red, or Sunrise Gold please.. While what you're saying is quite possibly true, those of us who stick only to the Note series don't care. You have to remember that while the audience for the S & Note series overlap, they are not the same. I'm not worried about how awesome a phone that comes out in 6 months that I don't plan on buying is going to be. I'm worried about how awesome next year's Note is going to be, but that's an entire year away, so the Note 9 will satisfy me until then.